A Ukrainian orchard is not just the totality of fruit-bearing trees on the territory of our country. It is also a composite image of Ukrainian traditions, the heart of our national culture, a symbol of the preservation and accumulation of mental data that is handed down through the generations. An orchard doesn’t have to be the one outside your window. It is inside us and in the outward manifestations of our uniqueness: our language and pronunciation, our gait and facial expressions, what we eat and how we design our apartments — and, of course, the way we dress. Thanks to its semantic meaning, a set of clothes, while remaining a material product, also discharges cultural and spiritual functions. Every outfit, depending on the origin of its components, carries a certain notional weight. What is the significance of the symbols of the Ukrainian national costume, which are being enthusiastically adopted today by trend-setting designers? The main elements of traditional Ukrainian attire date back to Kyivan Rus’. These are homespun tunic-like shirts, a rectangular ornamented belt, braided and woven belts, narrow linen men’s trousers, and rushnyk-like woman’s headgear. Our ancestors had to wear certain accessories in order to define themselves as members of a certain social group. In other words, maidens had to dress in a manner that placed them apart from married women; people living in Bukovyna dressed differently compared to those living in Slobidska [northeastern] Ukraine. Men’s clothing differed, depending on the region — e.g., the way men wore their shirts, tucked in or hanging outside the pants. Other local shirt-wearing specifics were manifested in the length of the sleeve or the shape and design of the shoulders, whether the sleeves were sewn with gussets and ruffles at the neck, collar, and cuffs. From the days of Kyivan Rus’ until the late 19th century unmarried girls wore their long hair loose with a part in the middle. While they worked, they would tie their hair in a single or double braid. In Prykarpattia it was traditional to weave in hair extensions made of red wool. Hutsul women would weave in a strand of yarn threaded with buttons into their braids. In the Poltava region girls sometimes made one big braid and additional smaller ones. There were many braiding and fixing techniques, but in practically all regions there was a tradition of decorating the head with flowers and wreaths. Hutsul maidens wore wreaths made of little glass tubules, along with multicolored ribbons, artificial flowers, and pheasant feathers. This technique is commonly known as karabulia. There is another technique practiced in Hutsulshchyna called chiltsia. This headgear, consisting of several thin, ornamented strips that hang on the forehead, is very reminiscent of ancient decorations from the times of Kyivan Rus’. Married women were more modest in their hair styles and headgear. “In keeping with ancient tradition, they did not make braids, they simply parted their hair in the middle and made a flat bun on the nape of the neck,” says ethnographer T. Nikolaieva. Later, this hairstyle was modified into a simple knot that could be tucked underneath headgear. Braids were worn only by women living in the Subdnister and Boiko regions, where ornamented hoods decorated with large hairpins were incorporated. It was considered a great sin for married women to walk out of their homes with their heads uncovered. For most Ukrainians the names of the elements of the traditional costume remain enigmatic and incomprehensible. Few know the difference between the vidloha [cape/hood] and zapaska, although we have all come across these terms in literature. The zapaskas, consisting of a front and back part, covered the thighs. In fact, it was an apron, usually made of wool. On weekdays women wore black or blue cloth zapaskas and red or green ornamented ones for holidays. The vidloha was a hood sewn onto an outer garment to protect the wearer from bad weather. Today we call the kozhukh, a sheepskin coat, a dublianka (winter clothing made of sheepskin lined with wool). Kozhukhs were traditionally ornamented with embroidery and appliques made of leather, cords, tassels, and other glamorous accessories. They were straight, wide-hemmed, or fitted. In a word, the many varieties of dubliankas that have become fashionable in the last decade are merely coats that were worn long ago. For a long time Ukrainians did not wear trousers, and the need for this type of clothing emerged only with horseback riding. In the mid-19th century trousers could be worn only when a boy reached the age of majority, i.e., after the age of 15. In the western and northern regions narrow pants called hachi were worn. The Zaporozhian Cossacks and later all the inhabitants of the eastern and central territories of Ukraine wore the billowing pantaloons called sharovary. A few words about accessories are in order here. Belts worn by our ancestors were true works of art. The nobility wore silk belts ornamented with gold and silver threads and studded with precious stones. These belts, which were handed down to heirs, depicted various markings, such as talismans and emblems. In the 19th century belts sometimes bore the owner’s initials or even the complete name, or the owner’s sweetheart, and date and place of birth. “Walking on the street without a belt meant discrediting oneself,” Nikolaieva says. Today’s popular hoop earrings were worn by our great grandmothers as a sign of mourning; they were modest and inconspicuous. Earrings worn on weekdays and holidays days were fashioned in the most chimerical shapes: ducks, crescent moons, berries, pears, poppies, and butterflies made of copper, silver, and rarely, gold. Girls had their earlobes pierced at the age of two. Losing an earring was considered a very bad omen. Coral necklaces were the most popular; they were even believed to have medicinal properties. Other popular necklaces were made of glass, amber, pearls, garnet, and smalt beads. Women in western Ukraine wore strings of berries, beads, and coins. The Hutsuls still wear zgardy, archaic pectoral jewelry with religious connotations. These are two or three strings of small crosses interspersed with pipes or spirals bent or twisted out of brass or copper. Given the diversity of styles, Ukrainian clothing and accessories have become an inexhaustible source of inspiration for today’s fashion designers. Hutsul accessories alone can build a dozen designer collections. Young couturiers are especially enthusiastic in showcasing ethnic themes, and they are convinced that this is the road to success. The latest “Fashion Seasons” showed that Ukrainian ethnic themes (two out of four) comprised half of the collection presented in the New Names category. The youngest participant, Olesia Telizhenko, offered a variation on the theme of the Slavic costume. Designers Molchanova/ Chava portrayed Hutsuls of the 21st century, wearing furs, traditional embroidery, and black and white color contrasts. The climax of the show was the appearance of Foma, leader of the Mandry rock group, clad in a shepherd’s linen clothing. 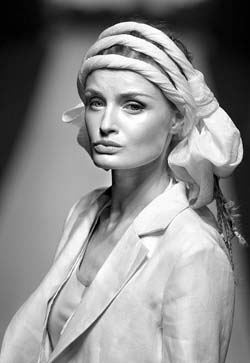 Lilia Pustovit, Oksana Karavanska, Roksolana Bohutska, and Iryna Karavai are the unquestioned leaders of the ethnic trend in fashion.